Need help please importing database from 3.6.1 to new iPad! It sounds like you may have tried that already, but if you can be more specific about where you're running into trouble I'm sure we can get this sorted out for you. Thanks in advance! All goes exactly to plan, but the database just won't import to the iPad successfully. I get through the steps as described and pictured on the web page, and import the file via iTunes, but simply get the message 'Import failed. Database is invalid.' on the iPad. Not sure what to try next! 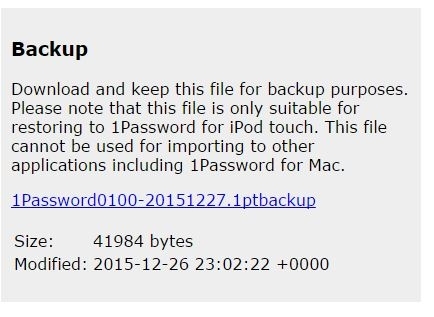 Two images here - one is the import file after syncing in iTunes (it seems to change it's name after the sync to the iPad) and the other is the original backup file that comes from the iPod Touch. Hope that helps a little. I'm using iTunes 12.3.2.35 64bit on a win7 pc. Did you do that before adding it to iTunes? Please let me know! yes I did do that - followed steps exactly, but alals, no luck. @trevorb: It looks like that's in Windows File Explorer. Did you add it to iTunes? Is it iTunes that is giving you an error? I did add it to iTunes, the image is simply to show you that I renamed the file extension. As I said, everything proceeds exactly as per your website instructions, but when I open 1Password after syncing the import file from iTunes, I get the invalid database error referred to in my first post. Just wondering if there's anything else I can try? May well be that I just have to transfer entries manually from the old version to the new, but I hope not! Thanks for your help so far, look forward to any steps you can suggest. Thanks Trevor! We've received the reports now and I've flagged them for follow up. We'll be getting back to you via email ASAP.